This unique complex litigation-focused book is co-written by the litigation-focused scientists and experts at Innovative Science Solutions and A2L's industry leading litigation consultants. It is summarizes the content from a popular webinar by the same name. 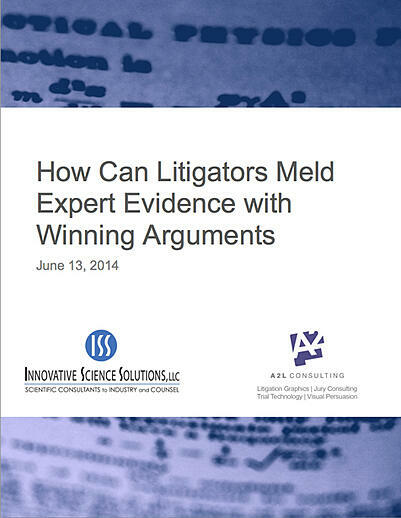 In 20 pages, we summarize the content from a recent and popular webinar, How Can Litigators Meld Expert Evidence with Winning Arguments. The webinar and book were co-produced by scientific consultants who have been serving the legal community for the past 25 years (ISS) and the best jury consultants and litigation graphics as voted by the readers of LegalTimes and the National Law Journal (A2L).